Lately at the dealership we have seen another rash of problems on the Chevorlet Cobalt and Saturn Ion vehicles. These are basically the same car, just different nameplates. What the customers are complaining about is a fuel leak at the fuel tank area, or a strong smell of gasoline coming from under the car. The problem they are experiencing is a common issue on some of these vehicles. The fuel pump on these cars is located inside the gas tank. and is sealed with a large rubber gasket and a locking ring to hold it in place. What is happening is that the top of the fuel pump assembly is losing it’s seal around the opening and fuel is escaping from around the lock ring when the tank is full or the fuel sloshes upward during turns, acceleration, bumps, etc. Another problem on some of these cars is the fuel is actually making it’s way through the wiring connector or holes for the fuel lines. This obviously is NOT supposed to happen and can be a very dangerous problem. Fires, explosions, and personal harm can come about if this problem is not corrected. Luckily, General Motors knows about this issue and has come out with a product safety recall to correct this problem. An entire new design fuel pump module assembly will be installed free of charge to the customer. This new design has been corrected and will not leak any fuel. To replace the fuel pump module is a bit involved, but not an entirely hard job. The fuel tank has to be removed from the car to access the fuel pump area and replace it. This is best done when the tank is at or near empty. Lifting a completely full gas tank is NOT something we mechanics are fond of doing, so do us a favor and run as much gas out of your vehicle before bringing it in! Once the tank is removed, it is a fairly simple process of changing over the pump. You have to remove the lock ring, then the pump assembly can be taken out. The fuel level sensor has to be changed over to the new pump, and then with a new gasket, the new pump assembly is reinstalled into the gas tank and sealed with the lock ring. Installation of the gas tank back into the car, fuel line attachments, wiring connector attachments, fuel filler hose, etc…and it’s all done. A quick start up after repairs are made will double check to make sure no leaks are found. All in all, a pretty straight forward procedure. If you have a Chevrolet Cobalt, Saturn Ion, or Pontiac G5…you may want to check with your local GM dealership to see if your vehicle is covered or needs this repair done. If you’ve noticed fuel on the ground or smell gasoline, get it taken care of as soon as possible! Below are a couple pictures of a job that was just done today on a Saturn Ion. You can see on the fuel tank how the leakage has run down the sides. This will give you an idea of actually how much gas can leak out of the top! 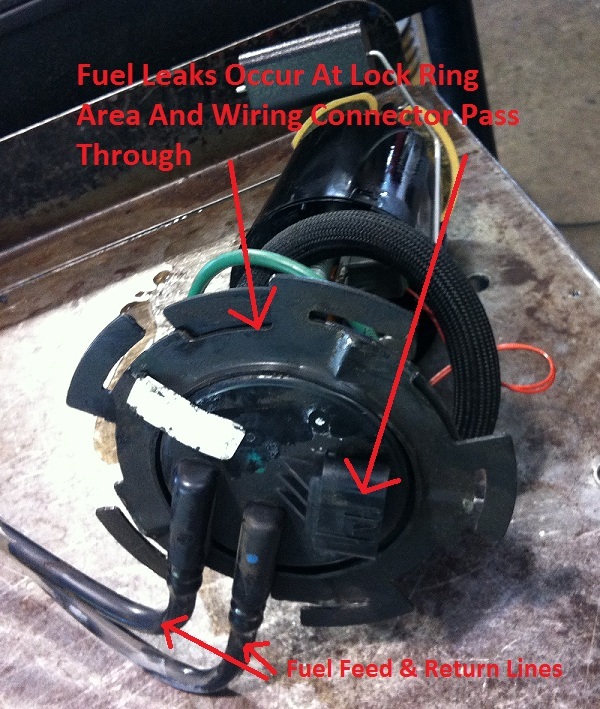 And in the fuel pump picture, some descriptions are given to show where the leaks occur. Chevy Cobalt and Saturn Ion gas tank leaking. 102 Comments on "Fuel Leak Recall On Chevrolet Cobalt And Saturn Ion"
I also have a gas leak showing under rear driver side door.this is on a 2010 Chevy cobalt LS. I haven’t saw a recall for this model year yet. Has anybody else had this problem. My 2006 cobalt is leaking fuel from the fuel line. I was told there is no recall for my car!! I have a 2007 Cobalt that is having the exact same issues. And also, I don’t smell gas in the car but once I’ve parked an am exiting my car, I get the gas smell. Is the 2003 Saturn ION 3 covered under this recall? Noticed a gas smell and my 2006 Cobalt SS had to crank a while before starting. Took it to the dealer, they checked and found that it qualifies for replacement tank and pump under program. Hopefully will get the car back next Tue. Only have 70K on this car, will be glad to get this fixed. I have a 2006 Saturn Ion. I just paid $700.00 to get my fuel lines replaced. My daughter has a 2007 Saturn Ion, she had a recall and they fixed her fuel lines for free due to a recall. My question is, Is GM going to do a recall for 2006 for the same problem? This is right at the Christmas season and it took a chunk of my holiday savings to get my car fixed. 2007 chevy cobalt with a bad fuel smell. I took it to the dealer and was given an 800.00 estimate to replace the fuel lines. This is an obvious manufacturing defect yet only the tank and pump have been recalled. I have a 2009 Chevy Cobalt that I just got from a used dealer and it smells like gasoline bad when I’m driving and when it’s just sitting in the driveway from the VIN it’s saying there is no recalls on it but I disagree cause it stinks bad what should I do? Is it running out onto the ground on the driver side near the rear left tire? If so, mine was doing the same thing. Thought it was having starting problems but seen it gushing out onto the ground. Left it at my mechanic’s garage where we discovered it. most likely one or both lines are rusted through in the area just in front of the driver’s side rear wheel housing. you;ll see the lines are wrappedd with a heat shield in that location. Most likely leaking fuel inside the heat shield area. I just replaced both lines on my 2007 last weekend. Had that smell of gas for a few months. Bought stainlesss steel replacements through rock auto for $142.00. I had 2007 Cobalt fix in 2015 for a gas leak it was cover under a recall. But now It is leaking again. Will this be cover again? just got off phone with a GM Rep. my 06 saturn ion has the same gas smell. They will cover fuel pump, gas tank , and 2 little plastic lines on top of the tank. NOT the actual metal fuel lines that run from the tank to the engine. The dealer said the fuel lines are rusty and leaking and can repair them for a additional $850.00 . It was the fuel line that had a crack in it. $615 ouch. This is robbery. I’m have a fuel leak on my 2009 cobalt right now. I called the locate GM dealer they check to see if a recall is out there. And NO it’s not. Just got my 2006 Chevy Cobalt back from dealer today, with the fuel pump/tank/pipe replaced free of charge. When I drove the car into the dealer service, they instantly told me that was a recall by the fuel smell, no hassle. I am in Beaverton OR. I just had my 2008 cobalt gas tank and pump replaced in Union Mo. It would have been over 1,000 to fix got it done free. So there are so many complaints about leaking fuel,gm acknowledged that it is dangerous and could cause a fire yet so many of the leaks are the fuel lines at the top of the tank were the fuel pump module is and the recall does not cover this.my 2008 had a strong gas odor and leaking at the top of the tank and just like everyone else I take it in pay the diagnostic fee and told it’s the line and for $900.00 we can fix it. That’s terrible gm how many complaints there are on this and yet no concern from you.I really have been let down by gm over the last 5 years. all 3 of my gm vehicles I own have a recall right now and yet the fuel line witch I feel is more of a issue than any of the rest is not one of them. Sorry that I feel let down by you and being dedicated to your products over the last 29 years I really am surprised by all the recent problems I have had.it would be great to hear why you show no concern to fix this problem.so they send my wife driving away with fuel leaking but not before collecting the diagnostics fee of course. same thing with me I live in Michigan…I have this gas smell, couple days later got worse know over $600.00 to replace the rusted fuel lines that are now leaking…Think recall should be for all Pontiac G5 2008 no matter what state I’m on disability and it is a struggle drop this amount of money on a issue GM has been aware of …I am disappointed in the way they lack to take care of issues from get go..
Did you go to a GM dealership? There are silent recalls and this might be one of them. Otherwise, call GM head office and if you don’t get a satisfactory response, ask to file a complaint. File a complaint online at BBB if you don’t have any luck at the dealership. You could also take this issue to a consumer helpline or the media if GM won’t help. Basically, keep complaining until you get them to fix it. You can also file a complaint with any government consumer departments. Just be very persistent. My moms car is Saturn ion and she got the recall part in mail on gas tank but it’s a revolution will they fix it ??? 2008 Cobalt in KY not included in recall. (wrong state)Had gas smell on shutting engine down..Lost fuel pressure causing car to hesitate when cranked cold. Visual moisture and strong gas smell on top of fuel tank. Called GM they scheduled a diagnostic check at dealership. Instructed if the fuel pump defect was the same part included in the recall it would be covered under ( special service bulletin) Dearlership confirmed the defect was the same and everything would be covered. Dealership technician said I would have to wait until they got the part to make the repair. Unfortunately the “special service” did not cover replacement vehicle. Here I am fourty miles from home and they tell me I can’t drive the car because it is unsafe. I had the same problem. My 2006 Cobalt was having problems starting, occasional rough idle and a smell of fuel when exiting the car. During an oil change I had my regular serviceman look into it. He checked the fuel pressure and found it was low. He lifted the vehicle to check for leaks and found fuel leakage coming from the top of the fuel tank. While deciding what do to I checked for recalls. I found this site and http://www.safecar.gov. I found a recall by GM dated October 29th, 2009 for the Fuel Pump Module. Recall #090226. There are special coverages for certain states. Called my local dealer who was also able to find the recall. They wanted me to set and appointment to have it diagnosed. I recognized it was just another way to soak my hard earned dollars out of me so I told them no. I told them I did not need “symptoms” or need to wait for a problem with a safety recall and therefore it did not need to be diagnosed. I told them to order the necessary parts and set an appointment to perform the recall repair. They argued but relented. If they find a leaking fuel line then oh well, I’ll pay for the additional repairs. When all is said and done the recall will be performed, any leaks fixed, and my vehicle will be safe to drive. I hope this helps and good luck. Joanne, I need to know what to do, my 2010 Chevy Cobalt isn’t covered under the recall, but gasoline starting spewing everywhere today. Call GM Corporate and get them to cover it. My dealer said they wouldn’t but I called GM customer service and it was fixed for free. My 08 cobalt hs recently started smelling lke gas. I have read there is a recall for fuel leaks, but not in the state of Ohio.The only warranty I have left is the emissions warranty. My question is this…..will the emiisions warranty cover this or will the recall be valid in the state of Ohio. This is NOT an expense that I can afford. I will let u know I am the owner of a 2008 yellow Chevy cobalt. I was experiencing the smell of gas the steering wheel tightening and popping and our account quit working I’m not sure what that meant. As of tonight 710 pm Muncie Indiana time I was driving down the road and heard a loud pop and I pulled over to see a lady motioning for me to get the heck out of my car! I got out just in time. 20 seconds later the front of my car was engulfed in flames. I was so scared! Yes fuel lines are included it’s part of the gas tank!! I just got my 2007 Chevy Cobalt fixed for this problem!! And you will need the fuel filter replaced on the car also!! When we got a hold of GM they told us it definitely sounded like the recall problem with this being said we set up a appointment with Dave White our local dealership, but when they looked at it they said it wasn’t a recall problem so we had to pay a tow truck to bring it home. The next day a representative from GM said Dave White was wrong and she had a tow truck take it back to them. Well Dave White’s employee called and said there was nothing they could do that it wasn’t the recall, I talked to the manager and of course told him who I talked to from GM, well I told him and then got another call from GM this happen to be a man at this time and he agreed with Dave White and they said it would cost over $800 to be fixed, needless to say we don’t have $800. 00 so we had to pay for the tow truck to bring the car back home and it’s just sitting here because we’re afraid to drive it because it could catch fire and someone could be killed or at least hurt seriously. This happened last summer and we’re on a fixed income so God only knows if will ever get it fixed. I love my car and I want it fixed. Thank God we have another vehicle I don’t know what to do! ! If you need to use my name Elizabeth Gallagher and my make of car is a 2007 Chevy Cobalt LS, that they just recently fixed for the gas tank, it was fixed by them free of charge!! So your car should be allowed this problem fixed by GM for free also!! And get the fuel filter replaced on the car also!! Good Luck. Take it to George Ballas on Central Ave. I just got my 2007 Chevy Cobalt fixed for this problem a week or so ago!! They fixed it free of charge for me!! It is a $1500 job and it will take a day or so to install it!! And you will need the fuel filter replaced on the car also. 2005 4 door Chevy Cobalt. Went in for an oil change & have a gas leak. The smell is horrible! Called GM & they told me not covered on the recall 😟 Gave me case number. I asked if we would be reimbursed if a recall is issued he said “it’s possible”. Not happy. Just called my dealer and told them I had been reading about it and mentioned the almost seemingly silent recall for the fuel pump module and almost instantly he went from not knowing anything to happening to find something about it and was 100% helpful from there out. They are going to replace the tank, pump, and all lines needed free of cost. I have a 2006 Cobalt … the fuel pump was leaking (both fuel lines busted off) .. apparently there is a “silent recall” on the Cobalt … this means the manufacturer attached a “special policy / rider” to these vehicles which does not expire which covers the repair and/or replacement of leaking fuel pump modules. Contact your local Chevy dealership and remind them of this special policy / rider that was attached to the Cobalt. I had no problem getting reimbursed by them after having my vehicle repaired at my local repair shop. I just had to fill out their reimbursement form and they submitted it. As for Saturn vehicles, I do not know… sorry. I own a Saturn 2005 & I am having a fuel (gas) smell coming from under my car for the last 2 or 3 weeks, I called to see if the recall in the above story was on my car & it wasn’t? Now what should I do? 2005 has the same fuel parts as the 2006 and no recall for the 2005 models …gas leaking into our water sewers?? More deaths?? Do not buy GM cars or trucks!! Call this phone number 800-222-1020 promp #3 tell the agent about the file problem ASK FOR A CASE NUMBER. There is a special coverage for this problem. I have a appointment with GM dealership to fix. Also ask if you can get a free hour diagnostic test. Your car is going to be fine . Remember ” seek and ye Shall Find”. Have a blessed day. P.S. Dealer did same to me? I just did the same! !2007 Chevrolet cobalt lt seriously fuel lake while the fuel is full!! Very serious ! The police man and fire alarm car all come to my place! I was very scared!! The chervelet decided to check my problem! I won’t buy America car anymore!! GM refuses to fix the recall. 2006 Saturn ION fuel pump leaks. Bastards! GM hasn’t yet provided a time frame for owner notification, but if you have questions you can read the official press release after the jump or call 1-800-630-2438 (Cobalt), 1-800-972-8876 (Ion) or 1-800-620-7668 (G5). I recently bought a 2006 cobalt and it has a fuel leak! I called chevrolet and they said that theres no recall for anything on the vehicle! It failed smog test because of the gas leak.dose anyone have any suggestions on were to start? I bought 2006 Cobalt LS for my daughter. We have same problem. I called local Chevy dealership, gave VIN # and yes there is a recall. Keep calling or go to GM corporate. 2003 Saturn Ion,smelling gas, took over to my local Good Year and said very dangerous, you can not drive. Gas line rusted out. I will call GM and NHTSA tomorrow January 16, 2015. Same boat as Joe. Rusty lines at the clamp. My leak was too bad to ignore. GM said cant help me. Its a 2007 ion. Why is the recall state specific ? My fuel pump is leaking and my lines are toast in a two inch section by the clamp. Rest of the line is like new. Car is at the Dealership and I am being told to wait on the air bag recall for a couple of weeks. Make no sense. Air bag light has been blinking on occation and i am scared to drive the death trap. fuel smell, leak puddle….found the fuel lines rusted through roughly under the passenger door, right near a plastic clamp that secures the lines to the chassis. Fuel line rusted and leaking! worst part…the fuel line is only a few inches from the hot exhaust pipe! and no recall with all these common problems. This is not only a safety hazard, its a fire hazard! GM needs to do something before we have a rash of carbques! We are experiencing a similar issue with our 2006 Chevy Cobalt SS. Strong gas smell outside the car, but doesn’t to appear to make a difference in the gas gage and not seeing fuel on the ground. Planning on calling the dealer tomorrow am. I am now noticing a gas smell in the garage and now inside the car on my 2009 Cobalt purchased in Florida, I mam going to check with the dealership this week, 10-6-2014, will post results, next call will be to the NTSB. I was wondering if their are any recalls for a 2007 Saturn Ion. I just got mine two or three months ago and if has a fuel tank but I noticed the smell of gas and found out the fuel pump was broke. Just call your local GM dealer- any Chevy, GMC, Pontiac or Buick and give them your VIN # and tell them to check for any recalls. They will gladly do that for you. My 2006 Cobalt is leaking too. Right on driver’s side, in front of rear tire. I parked for about 30 minutes smelled gas and saw about a 12 – 15 inch size puddle. I watched it for a few seconds and saw the gas dripping.